We are an arts guild whose vision is to promote the visual and performing arts of South Cowichan. (Mill Bay, Cobble Hill and Shawnigan Lake, BC). The Guild facilitates opportunities for artists and community members to create a variety of cultural activities. These can include dance, music, word and visual arts events that enhance the lives of people within the communities and attract others to visit the beautiful South Cowichan area. Thanks to all who came out for our 2019 Annual General meeting. The meeting was a great success, with lots of information and ideas, great music, and the election of a new enthusiastic Board of Directors to carry us onward into our next year of exciting arts events and activities in south Cowichan. 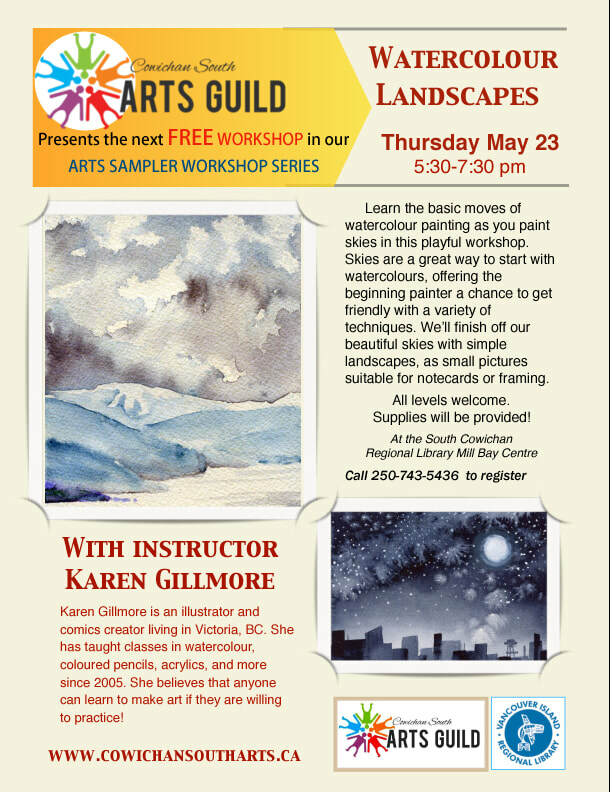 ​ "ARTS Workshop Sampler Series" for all our members! A CALL TO ARTISTS and for fun volunteer positions is out now for these events, click on our EVENTS page for more details on how to get involved! The next MUSICAL AND ARTIST EVENTS are in planning now - contact us to get involved, as artist, musician, committee member or volunteer. Now is a great time to renew your membership for 2019 if you have not already done so. A membership in this guild will allow you opportunities participate in displaying your work, play music for events, attend workshops, and keep in touch with other people interested in the arts in this beautiful area of the world. It will also mean that you are helping to develop this fledging organization which has been formed to promote arts and culture within Mill Bay, Cobble Hill and Shawnigan Lake. Click for more information on our events!